The minister was replying to a question about former finance minister and senior Congress leader P Chidambaram's remark that the government will be forced to heed the advice of the opposition. 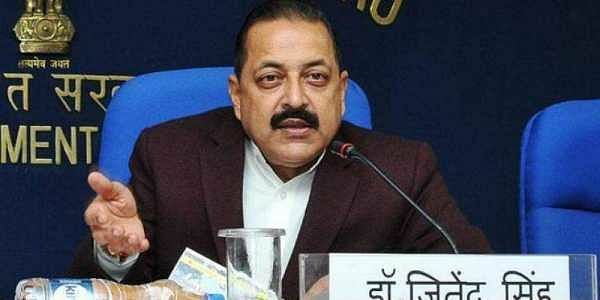 JAMMU: Union minister Jitendra Singh today said the GST rejig reflects the "sensitivity" of the Modi government and it has no hesitation in accepting inputs as the new taxation system is meant for the benefit of common people. Over Congress Vice President Rahul Gandhi's frequent visit to poll-bound Gujarat, Singh said the more he visits the state, the BJP gets more consolidated there as it exposes the "hollowness" of the Congress leadership. "We have no hesitation in accepting an input because GST, after all, is meant for the benefit and comfort of the masses and therefore their input is equally welcome," the Minister of State in the PMO told reporters here. The minister was replying to a question about former finance minister and senior Congress leader P Chidambaram's remark that the government will be forced to heed the advice of the opposition and experts due to the Gujarat polls next month. The Goods and Services Tax (GST) Council yesterday cut tax rates on over 200 items, ranging from chewing gum to chocolates to beauty products, to provide relief to consumers and businesses amid economic slowdown. "As far as modifications made by the GST council are concerned, I think this is a reflection of the sensitivity with which the Prime Minister Narendra Modi-led government works... this is the government which is open to inputs. "As PM Modi has said, we are not here to run the government but to run the nation," Singh said. Criticising Chidambaram, the minister said the Congress leader has many things to thank the BJP for. "Chidambaram should thank the Modi government for having brought the GST to a logical conclusion and culmination which he could not do during the 10 years of UPA rule. He has many things to thank BJP about," Singh said. On frequent visit of Congress Vice President Rahul Gandhi to poll-bound Gujarat, Singh said, "The more he comes (to Gujarat), the more BJP gets consolidated in the state. Therefore, his visit to Gujarat is welcome for the BJP. The more he comes, the more Congress leadership tends to expose its hollowness on various issues." They (Congress leaders) were somehow "misguided" that they have the support or might get the support of certain communities or business sections, which they have realised is not true. "They saw it happening in Surat the other day when Rahul Gandhi decided to visit a textile market and was greeted by slogans of 'Modi, Modi, Modi'," he said.